Ahead of innovateworkTO this week, the team at The HR Gazette got a chance to chat with Zoom.ai CEO, Roy Pereira. Here’s the first of a two part interview. Read the second part at our partner title, WorkingTech. Tell us about your career up to joining Zoom. I took Computer Science at Carleton University in Ottawa and couldn’t wait to “change the world.” Formerly, I worked in the Federal Government in IT but quickly left to create my first startup focusing on Internet connectivity which won several awards. I realized that I didn’t know much about running businesses, so I joined a “real” startup called TimeStep, and that’s where I invented Secured Remote Access VPN and then moved into marketing/product management. Shortly after, Cisco Systems came calling, and during my tenure there, I moved to Silicon Valley where I help create the security line of business. When I left Cisco, we were generating $1.2B per year and had 92% market-share. I came back to Canada for Certicom and was part of its “turnaround” management team where we increased its stock price by 500% over three years after the dot-com-crash. Since then, I have been part of start-ups, or have founded start-ups. My last ventur, Shiny Ads, revolutionized the instant buying and selling of premium online advertising and was acquired by Rubicon Project in 2014. Why Zoom.ai? Why was it founded and what key primary challenges does Zoom.ai address? Once my team and I joined Rubicon Project after they acquired ShinyAds, I realized that enterprises were very becoming lean and had done away with most supporting staff. In their place, the employees had been saddled with a lot of applications. But these applications turned each employee into their own admin and caused them to not work on their real job during most of the day. Employees were feeling over-worked and that they couldn’t properly finish their real jobs. 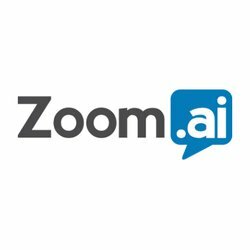 Who’s your target audience and what problems does Zoom.ai solve for them? Zoom.ai targets both mid-market and enterprise companies. Our end users are all employees at these businesses that do not have an assistant. How has social media and mobile use, impacted your solution development and market strategy? Chat is easy to use both on the desktop and on mobile. Employees love to use chat since this is their preferred UI for other daily habits. Lastly, how can we learn more about Zoom.ai? www.zoom.ai and attending events like InnovateWorkTO. Roy Pereira began his first startup after attending Carleton University’s computer science program. Since then he’s created several startups and worked with numerous tech companies based in Ottawa, Silicon Valley, and Toronto. patents on remote access IPSec VPN software. In 2007, Roy started the world’s first Facebook marketing agency. In 2009 he started his fifth startup, known as Shiny Ads, to help the world’s top digital publishers better monetize premium ad buys and, in the process, invented an alternative to RTB called “automated guaranteed.” Shiny Ads was later acquired by Rubicon Project (NYSE-RUBI), based in LA, in 2014. This article was first published in The HR Gazette.